Nestled in the Winter Gardens on Margate’s seafront held between the 19th and 21st of February, the three-day event that is GEEK 2015 accommodated a plethora of old and new gaming consoles from around the world. Set into different zones, there was a chance for paying members of the public to play different types and genres of games. From action, sports, simulations, shooting, fighting and puzzle games spread over all generations of Nintendo, XBox, PlayStation, PC and Sega systems (to name but a few). It was hard not to be spoilt for choice on what you wanted to have a go on next. Ever wanted to play on a Nintendo Famicom with a mouse? Never got round to playing a Dreamcast? Want to know all the fuss is about with the new Call of Duty? Felt the need to show off your battling prowess in Pokémon against real players? All of these questions could be answered. With the main hall featuring the massive selection of gaming consoles, another full of exhibitor’s stalls with a secondary stage set up for interviews and a final Chill zone complete with niche indie games and mood lighting, there was always something worth your time. Starting with the exhibition hall, you could get all your game and pop-culture related merchandise from this opening hub allowing you to purchase retro games, character prints, and mugs, wallets t-shirts or even classic sprites made out of Hamma beads. You could also pick up your copy of the Geek Gazette – a useful souvenir guide full of articles, interviews and information on all that was happening over the weekend. Set to the other side were board games and players teaching others the ins and outs of their favourite past times. Another hidden gem was the simple computer arrays made of old egg boxes and some that replaced input devices with forks and knives. The stage headed the front of the space which held informal interviews with YouTubers and indie developers as well workshops with cosplayers and the Saturday afternoon’s cosplay masquerade (other days held talks about video game narratives, a showcase of the Unity gaming engine and storytelling workshops over the weekend). On the upper gantry, more board gamers were set out and there was also an opportunity to meet with the previously mentioned YouTube personalities and ask them questions one-on-one. The main hall held the meat of the event; a vast room full of the consoles before and during our existence. We jumped straight onto Puyo Pop Fever on a GameCube – a colourful but crazy falling blocks game – and although we had no idea of the controls, we picked it up very quickly and were battling it out to see who could get the highest score. Saturns, Mega Drives, PlayStations, NES’ and SNES’ caught our attention the most as we played through some well-known titles such as Clockwork Knight, TOCA 2, EA Hockey and Yoshi’s Cookie. The sixteen XBox 360’s playing Halo deathmatch tournaments centred the room; Hearthstone had a few machines dedicated to its own mini-contests and newer blockbusters such as Call of Duty: Advanced Warfare, Assassin’s Creed: Unity, WatchDogs, Far Cry 4 and Need for Speed Rivals on current generation consoles were contained in an 18+ area for obvious reasons. Having never played some of these on a newer system, this gave us the opportunity to try them out. It was also good to see some of the greatest and newest indie titles such as Fez, Thomas Was Alone, Shovel Knight, Super Meat Boy, I am Bread and Screamride hold their own against the likes of FIFA 15 and Halo’s Masterchief Collection. Although no-one could compete with the greatness of Minecraft. It had its own special area with a queue to get in and its own tournament. Not hard to understand as it’s one of the biggest selling and most popular games. Another selection of stalls then sold modified Gameboy’s, figurines, cartridges and table top games which included our personal favourite, Rory’s Story Cubes (review imminent). And if you wanted to take things a bit easier and remove yourself from the scale of the event, there was also the Chill Zone filled with ambient lighting and independently developed games that reflect on the cool and calm. Whether you wanted to jump from cloud to cloud as you drift through the storybook world of Castles in the Sky; explore as a rolling cube in a geometric domain in Cube and Star: An Arbitrary Love; sore over Journey’s sand dunes; float through the neon-rainforests of The UnderGarden or simply watch a projection of someone else wander through a world of beautiful glowing particles in A Light in Chorus. This zone also became a small theatre later on in the day as it showed the 2012 documentary, ‘Indie Game: The Movie’; a nice change of pace from the hectic Main Hall. But of course this was only the tip of the iceberg since we only went for the Saturday. Earlier that morning there was a Guinness World Record attempt to beat the quickest time in completing Bricking It in Time Splitters II. There were different retro gaming tournaments running throughout each event too with a Sonic challenge each day, a Mario Kart 64 challenge on the Friday, Street Fighter II on the Saturday and finally a Super Smash Brothers Melee closer on the Sunday with prizes from each awarded to the best player. With enough differences each day to warrant a subsequent visit it made for a very unique day out. We had missed the early ticket sales online but on they were reasonably priced at £15.50 on the door and you definitely got a lot for your money. Friday and Sunday were slightly cheaper but only by a pound or so but with it being the start of the weekend, it was easy to see that the Saturday was priced the way it was. Either way, no matter what day you could have chosen, you wouldn’t have felt any less out-of-pocket. Getting around was fair also; the map included in the guide was clear but having a list of what was on offer from the off would have been a great way to go around and essentially tick off our favourites or finding something that sounded good. Luckily a lot of what we played was found with our eyes and that was probably and arguably a better way of discovering. A few machines did cease to work but that’s only understandable when a twenty something year old console is running throughout a day of a busy play through and lots of play styles. On the other hand, seeing older Master Systems and NES’ continue through it all just shows how they can continue under pressure. And so our time at GEEK 2015 was a pretty epic trip down memory lane, reliving some of the nostalgic games we used to play and also getting a chance to try something different which may have otherwise been overlooked. We have both been avid gamers for a long time and so this event has given us a taste of gaming exhibitions; something neither of us has experienced before but it’s something that we would wholeheartedly recommend to gamers and pop-culturists alike, no matter what the scale. Although compact, GEEK 2015 offered us a new insight into one of the world’s biggest and best mediums. Hopefully we’ll get chance to go to the event in 2016. It certainly beats sitting inside and playing video games all day. Almost two years after originally purchasing Dead Space, I finally got around to playing it through its entirety. Other games have graced my PS3 in that time but, after a long hard think about it, it was time to see it through to the end. If you don’t know, when I first got it I was petrified of it. Fast forward to now and not much has changed. I tried to put my fears behind me and solemnly ploughed through the terror; the same terror that enthralled and engrossed me to keep going. 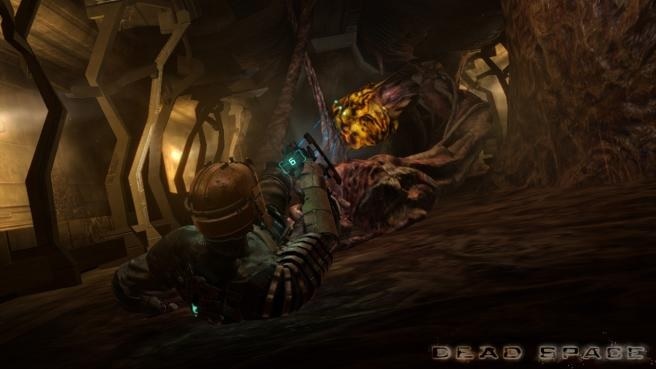 Dead Space is a survival horror game about a space engineer called Isaac Clarke who ventures onto the distressed USG Ishimura; a spaceship designed to collect and mine minerals and resources from other, deep-space worlds with the intention of replenishing what had been lost on Earth after a near wipe-out. The ship encountered danger when trying to find a religious artefact called The Red Marker on the planet Aegis VII. With the Ishimura taking the artefact, a wave of mutation began to run amok and as a result, the ‘planetcracker’ spaceship took a turn for the worse. The crew became infected with a parasitic life-form that turned them into Necromorphs; hideous, grotesque but vastly intelligent beings with the sole intention of turning Isaac’s brains into jam. Isaac battles his way through the ship with an array of tools at his disposal, cutting down Necromorph after Necromorph along the way. In basic technical terms, Dead Space is your run-of-the-mill corridor based third-person shooter. Further from that, the mechanics of the game spread out above and beyond making this an edgy and scary experience. Although it follows tropes of having to follow simple objectives made a lot harder by obstacles such as a lack of oxygen or negotiating zero-gravity puzzles, it managed to keep me on my toes at all times. The tight, narrow corridors feel claustrophobic; as though running back from whence you came is not going to do you any favours. Having to fight the mutated remnants of the crew in such a constricted space makes you think of your movements and actions carefully before attacking. Sometimes you have enough time to go over the meticulous details; other occasions not so and you find yourself in a rush of panic as a Twitcher or Brute comes charging for you like a bullet. More often than not, I found myself creeping along edges of corridors in-case I came across something that might be around the next corner. It made me think, which weapon do I use? Do I use my heavily upgraded plasma cutter or shall I just unleash a torrent of fire with the flamethrower and then slice the limbs off with the Ripper? If option A, do I have enough ammo to last me a barrage like that? And so on until you inevitably run through so many options that by the time you get to the Necromorph, it has already sliced Isaac in two. You also have to remember what you did in previous rooms. Before I cottoned-on, it wouldn’t be rare for a dead Slasher to rear up when you least expect it. Now that I’ve become accustomed to this behaviour, remembering who or what you killed previously can save you the fright of a life, and so if you spot a body in a place you don’t remember it being, chances are it isn’t dead. Fortunately with my gun-ho attitude whilst playing, I try to brutalise anything in my way regardless. Everything else does an amazing job in setting the scene and capturing the horror. The sound design for example is astounding. Every noise the ship makes keeps you alert. The rattling coming from the air vents; is that normal or is it a Lurker? Then the jarring symphonic strings start up and you know for fact that something just burst through an inlet, but where that inlet is, is anyone’s guess. Finishing an objective gives a reassuring hum and a bright blue glow to let you know everything is under control. Graphically, although the game is going on six years old and was made in the earlier days of both the Xbox and PS3 life, it still looks good. The read-outs on the weapons and Isaac’s suit contrast the dark environment and they are clear and precise, as are the menus and the guidance line. Dust particles illuminated by the lights fill the air in certain sections and the grisly textures of enemies are a nightmare in themselves. There are a few visual quirks on certain things and the physics engine does make corpses wrap around Isaac’s feet and then bounce off down the corridor (sometimes for the worse; the amount of times a loose flailing limb has nerved me into thinking it’s anything but was absurd). Even having the menus happen in game rather than a standard head up display simply adds to the immersion. There’s nothing more tense than trying to swap out an air can as Isaac is desperately losing his breath whilst Necromorphs continue their assault. Adding these together can make for some intense sequences. When an area goes into a quarantine lock down, you know about it even when you don’t expect it. Everything goes dark, all bar the strobe of a lone, yellow warning light and the doors are barricaded with a heavy thud, as Necromorphs you previously thought weren’t there, come snarling in. With nowhere to hide, blasting through the extra-terrestrial zombies is your only way out that can lift the quarantine lockdown. Other times, the game plays with its flaws. We all know that with video games as you progress a new area has to be loaded. Dead Space does this with lifts and doors. In the lifts, enemies can burst through the ceiling and commit you to battle in something no bigger than a wardrobe. Doors to bigger areas don’t open straight away; you have to wait for the area to load. This doesn’t break away from the immersion as you can hear the guttural roar of a Divider coming up behind you and the pulse in your head as you frantically try to get the door open knowing that if you do turn around and open fire, the smaller creatures that make up the monster will ultimately deplete your ammunition. Shouting ‘open the door!’ doesn’t really do much either but the safe haven behind it is so satisfying. E3, or the Electronic Entertainment Expo, is arguably the biggest and boldest annual video gaming convention ever to grace the planet. Held in sun-drenched Los Angeles; the big guns of the gaming industry including Microsoft, Nintendo and Sony showcasing brand new hardware and games. The event is a pantomime of lights, music, noises and good old’ fashioned video games. Held exclusively to the press and industry members, the entire convention is streamed online for all us norms to watch at home. And that’s exactly what we did. People from all around the globe watched with bated breath waiting for what the next big announcements were coming to PC’s and home consoles over the next few months and beyond. This is a list some of the notable games and software that hooked us to spend all our hard earned money on the most expansive and by far best consumable media there is. Once upon a time, Sony was unknown as a games console manufacturer. They fought off the likes of Sega’s Saturn and they tussled with Nintendo’s cartridge based N64. And this suit followed in the next console generation. With the release of the original Xbox and the Gamecube, Sony went from strength to strength. Even with more recent efforts when the Wii and the 360 started to catch up, Sony still went hell for leather and provided some amazing experiences. The PlayStation, PS2, PS3 and now PS4 has allowed Sony to keep Nintendo and Microsoft in check as it never fails to deliver. Last E3, Sony alleviated themselves above the rest and although this E3’s contributions weren’t on the same scale as before, they still know how us gamers tick and they feed off that to create something a bit different and a wholly satisfying. Ah, LittleBig Planet; cute, simple and full of joy. The first instalment was and still is impressive. Whilst the main story was great, the game was used as tool for community gamers to create their own unusual levels and share them amongst the world. With number 3 coming out soon boasting the same levels of limitless creativity and three extra characters – named Oddsock, Swoop and Toggle no less – Sackboy’s crazy adventures will surely continue in the zany way the series is known for. Media Molecule, the brains behind the franchise, has added multiple new abilities and items to capture more stickers, bubbles and to solve puzzles in interesting ways. ‘LittleBig Planet 3’ apparently includes all the previous games levels, letting you play through great moments again in glorious hi-definition or merely, if you never got the chance to before. A heavily block coloured and simply stylized ‘No Man’s Sky’ was shown. A part first person adventure part flight sim with phenomenal visuals and apparent continuous exploration, No Man’s Sky has players dog-fighting spaceships amongst asteroids, delving to underwater realms and walking through luscious landscapes teeming with life. The timed exclusive also features real time dives to planet with mountain peaks and crevasses seamlessly coming into view as the spaceship barrel-rolls through the chasms and ravines before blasting back into space. Each planet will seemingly be procedurally-generated; a common theme that is running with new games. Each world would be different and it’s up to you to make the choice of flying past it or cautiously explore it. It evokes a similar style to the independent game called ‘Eufloria’ but on a much larger scale and an increased colour-pallet. Again, like ‘Eufloria,’ this massive game isn’t made by a huge developer. It’s made by Hello Games; a group of about ten people in Guildford. This proves that no matter how much money or man-power is needed, something special can still be created out of something small and can compete with the heavyweights. Batman returns in ‘Arkham Knight’. Some information has been known for while on the caped crusader’s upcoming game that was up until recently delayed to 2015. So Sony whetted our appetite and showed us gameplay footage. After Batman elegantly dives and swoops through the Gotham cityscape he firmly lands only to be greeted by an all-new Batmobile that can not only powerslide through the streets but also crab sideways while using some reckless bravado and insane firepower. Gotham is recreated spectacularly and the vibrant neon highlights the structures and landmarks. With an array of gadgets as his disposal, he successfully clears his way through armoured vehicles and escapes by ejecting out of the Batmobile and gliding into a brutal fist fight. The footage shows a lot of atmosphere as Batman plans his approach and attacks before the game glitches. Scarecrow takes over and announces his intentions of bring Gotham down… ‘Arkham Knight’ is not only a game that appeals to the hard-core comic book fans but also those who want to get into the Batman franchise. I for one am incredibly interested in this and I haven’t had much experience with past Batman games. Maybe it’s time to get started. Bungie-made (who are responsible for ‘Halo: Combat Evolved’) ‘Destiny’ was shown as an alternative shooter to Halo for the PS4 with exclusive access to alpha and beta gameplay. A new white PS4 with a copy of Destiny included is also available. More gameplay footage of Ubisoft’s epic ‘Far Cry 4’ showed off an infiltration of a basecamp, a tuk-tuk escape, a truck plummeting off a cliff, flying-squirrel type jumpsuits, elephants, a co-op buddy joining the assault, gyrocopters, machine-guns, explosions, grapple-hooks, drive-by shootings, carjacking whilst in motion and exploding elephants… But something that set it apart from the rest was the fact that anyone can join. As long as someone owns a PS3 or PS4, anyone can join. They don’t even have to own the game itself. I am curious to how that works but it sounds incredible. Big news! ‘Grand Theft Auto 5’ is coming to PlayStation 4, as well as Xbox One and PC. Yep. Finally, you can experience Los Santos and Blaine County on new home consoles. Many petition signers will be happy. Sony announced a plethora of hardware news too including information on their camera and VR headset, project Morpheus; they announced a partnership with YouTube for unified uploads from the PS4; streaming service PSNow was also mentioned with many gaming and film/TV titles becoming available for ‘renting’ over the course of the next year or so, and, providing you have a dualshock 3 and a Sony Smart TV, PSNow can also be linked up without the need of any PlayStation console; games can be played through the TV. ‘Mortal Kombat X’, ‘Let it Die’ and ‘Bloodborne’ were probably the goriest of the showing. Broken jaws, huge wounds and much slicing and dicing were all present; enough to turn even the strongest of stomachs to jelly. Much to the frustration of press and gamers, ‘The Last Guardian’ never showed light. Announced at E3 back in 2009, the Sony Computer Entertainment exclusive action-adventure game – originally planned for the PS3, no less – is currently still in development. Whether it will be announced at a later games conference or not at all is still a complete mystery. All we know about ‘The Last Guardian’ is it is still a loose cannon. We just don’t know when Sony will take it upon them to spill the beans on this hotly anticipated. Also the Vita’s back-catalogue wasn’t really improved upon. Although selections of games were shown in a montage, there wasn’t anything stand-alone amazing that said ‘this is what the Vita can do’ that has blown minds. Sony had a huge conference; it was almost two hours long. This meant they showed a lot of games but it was also hard to pick a definite unique selling point. With the giants of ‘Destiny’, ‘Grand Theft Auto’, ‘Mortal Kombat’ and Far Cry sharing the limelight with ‘LittleBig Planet’ and ‘No Man’s Sky’, each with something new and brilliant, whittling them down was a difficult objective. Far Cry 4 appears to be a vast open world where, as the trailer says ‘each second is a story.’ ‘LittleBig Planet 3’ adds more cheeky characters to design and build and play away to your hearts content. Batman’s stunning visuals took centre stage with that of an indie developer’s exploration simulator. And for once these games that Sony showed us, no matter how gory, simple, complex, explody or elephanty, felt like they all fitted together for the Players. Oobisoft? Yoobisoft? Maybe it’s something totally different, like ‘Ewbisoft.’ Whatever you call them, they’re a fantastically, quirky games developer. From action adventure epics to tactical shooters and beautiful platformers, Ubisoft are reliable for providing the world with ‘Assassin’s Creed’, ‘Far Cry’ and ‘Rayman’; making software for casual, dip-in gamers, to the hardest of core gamers; Ubisoft has everyone catered for and they do a good job of it. With ‘Watch_Dogs’ taking centre stage in the past couple of E3’s with mind-blowing visuals and stunning gameplay, and it was released a few weeks before the presentation. It was going to be interesting to see what they could show off this year and to see if they could create a tornado of hype from other, more established franchises. They didn’t fail to deliver. ‘Just Dance’ is a funny old series, starting back in 2009 on the Wii with roots in ‘Rayman’s Ravin’ Rabbid’s’ game. Now in its sixth iteration, the worldwide mega-seller is back for sillier dance moves at your next alcohol fuelled family gathering. A trailer featuring a number of elaborate groups of people dancing to their on-screen leaders to Pharrel Williams’ sickly infectious ‘Happy’ is shown before moving on in true E3 form by getting a load of actual dancers on stage to rave to the newly announced ‘Just Dance Now’. An app and tablet/smart TV based that allows gamers to play Just Dance with their smartphone. The app is connected to a bigger screen to show the players what to do whilst the phone itself uses the power of the built in gyroscopes to recognise the movements as you do your dancy thang with an infinite number of others. This interesting concept will get regularly updated with new songs and dance moves in the future. ‘Assassin’s Creed’ opened up a new world of possibilities for me. As I was stuck playing mostly racing and driving games, I got immense satisfaction soaring into haystacks, traversing high walls and plunging hidden blades into enemies. ‘Unity’ is the new offering. Although Microsoft showed a multiple player co-operative mission of Unity in their press conference, Ubisoft gave us a glimpse of a solo objective. After short atmospheric trailer, the gameplay began at the very top of Notre Dame. Our Assassin swiftly and bravely dives off the tower, catching every other wall, gargoyle and protrusion on his way down. This assassin doesn’t care much for haystacks it seems but his decent is quick and nimble. He reaches a vastly populated terra firma and objectives pop up as he blends in with the Parisian crowds. He encounters a restricted area and promptly uses his hidden blades on a couple of unaware guards. This follows with familiar swordfight. Sparks fly from sword blades and the finally the guard is taken down with a slice to the throat. Our assassin now searches for potential targets and proceeds to hunt them down. He slinks down behind cover, staying out of view of potential foes and silently creeps from one crate to the next. The man he is after is not where he thinks he is but gets word of the actual whereabouts. As our assassin darts out of the window and across roofs, icons pop up. As there is no map, this could possibly the new way how we as players find missions. He now scuttles through houses and crowds and back up wall with acrobatic finesse, getting to a higher vantage point to find his prey. He finds the man he is after and follows him via rooftops to a guillotine. He picks his moment and pounces from the guillotine itself, forcing his hidden blade into the Captains neck. The guards around rear up as our assassin is joined by his fellow co-operative brothers, ready to take on the ensuing onslaught. Unity is on good form. ‘Assassin’s Creed II’s’ Italian setting defined it and going back to a similarly stunning location and time period rather than the later colonial America of III is going to be favourable with fans. I for one cannot wait to see how this develops. ‘Battlefield Hardline’ has a new competitor it seems. A new Rainbow Six had been in the works and was overdue. The most recent utterance of a new Rainbow Six for consoles and PC after ‘Patriots’ was cancelled was 2008’s ‘Vegas 2’. This multiplayer pre-alpha level features a bunch of good guys planning and taking out the bad guys in a hostage situation, showing its mettle in a five versus five match. Again like Ubisoft’s ‘The Division’, it unrealistically gave us this heavily acted interpretation of an online multiplayer match. But cheese aside, the elements that were shown provided enough coverage into how ‘Siege’ can bring something interesting to the table. Gun shots can fire gaping holes into the wall that players can then shoot through themselves to take out the enemy. This type of procedural destruction adds to the immersion and realism. Battlefield may have had its ‘levolution’ moments that drastically altered the map but the smaller details on something like a house falling bits when a player blows a hole in the floor to get past barricades may not be the same as tumbling buildings but using the destruction adds a tactical approach. The footage ends with a one on one cliff-hanger. Ubisoft’s open world multiplayer racer, ‘The Crew’ was shown in a time lapsed compilation trailer of races that span over two hours filled with high powered supercars bursting through urban jungles, sand-filled canyons and winding hills. ‘Valiant Hearts: The Great War’; a touching UbiArts side-scroller inspired by events from the First World War. With a cartoony animated style but also a heavy message, it expresses an evocative atmosphere that is aching to be played, just to see and hear the stories it can tell. By the looks of things, ‘Shape Up’ uses the Kinect to its full ability. With crazy push ups and ‘Dance Dance Revolution’ inspired challenges, this is bringing motion controlled games up to scratch. Where to start? ‘Rayman’ was not present; his fury yet crazy pests the ‘Rabbids’ were relegated to the introduction; so we can’t expect any of that ridiculous fun from previous instalments on newer consoles just yet. The Driver series could have also been touched upon but, alas no. I think that last year’s ‘Watch_Dogs’ being a similar open world game with driving might have become a bit repetitive which is a shame because after ‘San Francisco’, Driver proves that it can still provide hours of joy and entertainment. The French company did well this year. We’ve seen the next instalment of the ever-popular Assassin’s Creed; we’ve met psychopaths and are intrigued by their motives in Far Cry 4; we can dance with as many people as we want to with just an app and a fancy TV; and we can use our Kinect’s for something half decent! It’s hard to pick a firm favourite because these titles all have something that appeals; which is what Ubisoft (‘Oobisoft’? ‘Yoobisoft’? Actually, it might also be ‘Ubbisoft’…) is all about.